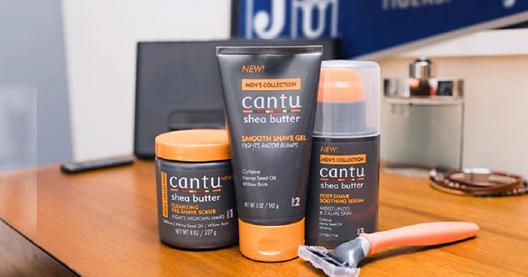 Treat your man to FREE samples of Cantu Men's Collection, while supplies last. Cantu Men's collection is specifically formulated for the needs of men with wavy, curly, and coarse hair. All-in-one Shampoo, conditioner and body wash -- moisturizes dry scalp and skin. Infused with caffeine and hemp seed oil to help hair grow stronger, thicker, healthier, and increases scalp health. Cantu Beard Oil -- unique blend of caffeine, hemp seed oil, and tea tree oil seals in moisture to soften and nourish hair. Cantu Men's Cream Pomade -- provides a strong hold and soft touch. Our unique blend of caffeine, hemp seed oil, and shea butter delivers strong hold and defined curls with touchably soft results. Cantu Men's Leave-In Conditioner -- deeply moisturizes to help prevent and repair dry, brittle hair. Cleansing Pre-Shave Scrub -- helps minimize ingrown hairs. Exfoliates the skin and aids in healthy hair growth, helping to minimize ingrown hairs.